Combination of the Club burgee and Club Ensign as a package. 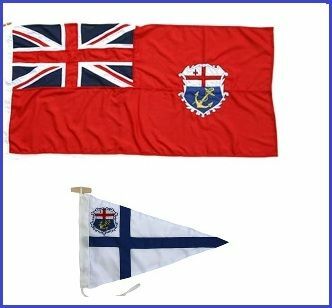 A choice of small or large club burgee together with a range of sizes of the defaced red ensign. Note to fly the defaced ensign you need also to buy a "Permit to Fly" available on line in the store. A range of other sizes of burgee and ensign are available to order by contacting merchandise@lloydsyachtclub.com.